WE CORDIALLY INVITE YOU FOR OUR GLASS FORMING SHOWS! The only place of its kind in Kraków! Encounter the fascinating world of glass. 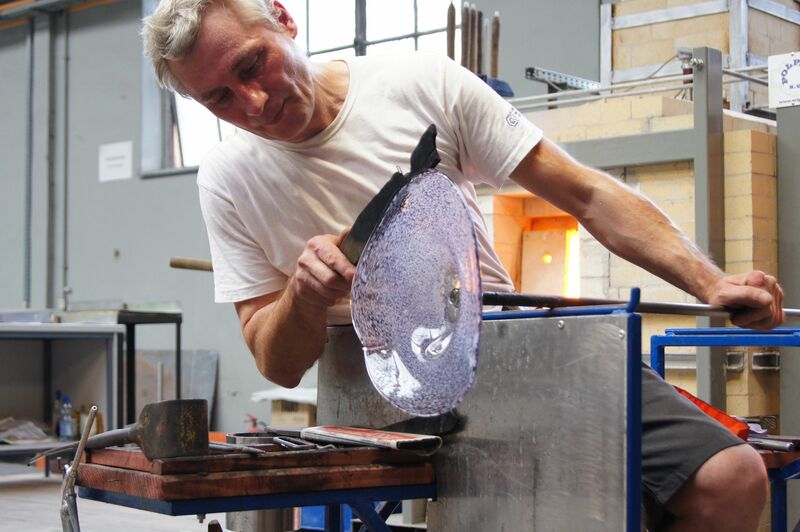 Take part in an exclusive demonstration of hand blown glassmaking. Learn about traditional glassmaking techniques, observe the process of glass creation and try Your strenght as a glassmaker. Raw materials of mineral origin (e.g. sand, limestone, dolomite) and raw materials that are the products of the chemical industry (e.g. soda) are used in glass manufacture. Glass is obtained by melting an appropriate composition of raw materials. Preparation of a glass-forming set consists in weighing, according to the recipe, of carefully selected and prepared raw materials. The weighed set components are mixed in mixers. The finished glass set typically undergoes a granulation process to prevent dusting during filling. Due to its characteristics, glass can be formed using various methods, e.g. by casting, drawing, blowing, rolling, or pressing. 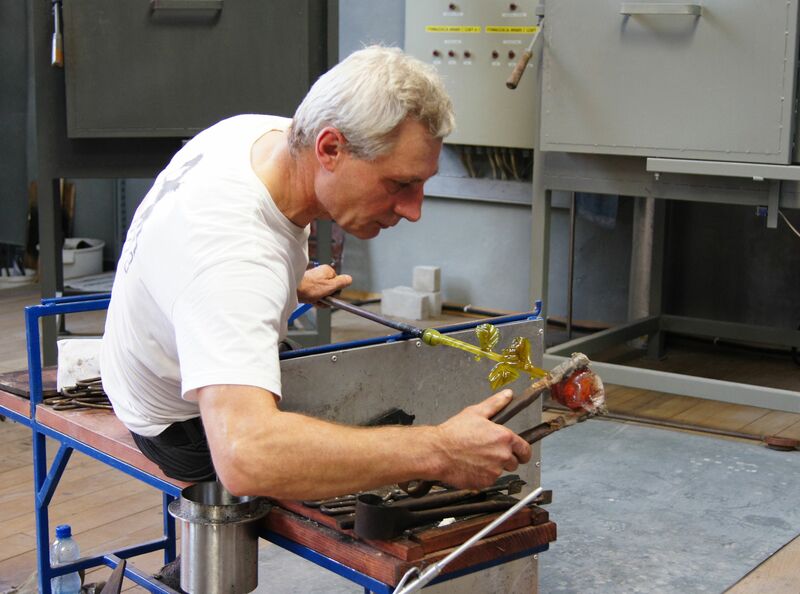 The forming method demonstrated at the Glass and Ceramics Centre is mainly glass blowing. Hot, molten glass is placed on one end of a long metal tube called a blowpipe. Then a glassworker (glassblower) forms from the shapeless mass a glass bubble on which, after cooling, additional portions of glass can be applied. The glassblower, rotating the blowpipe and blowing into it, forms a product of a desired shape. During the forming process, the product is heated in a furnace, in a so-called drum furnaces at the temperature of 1,300°C to have an ornament or a handle attached to it or to form it further to obtain the required shape. During the forming process, shaping blocks made from beech wood, pre-soaked in water, may also be used. The formed product is cut out of the pipe using a scraper (a type of knife) pre-soaked in water, and then the product is carried on forks to a lehr. 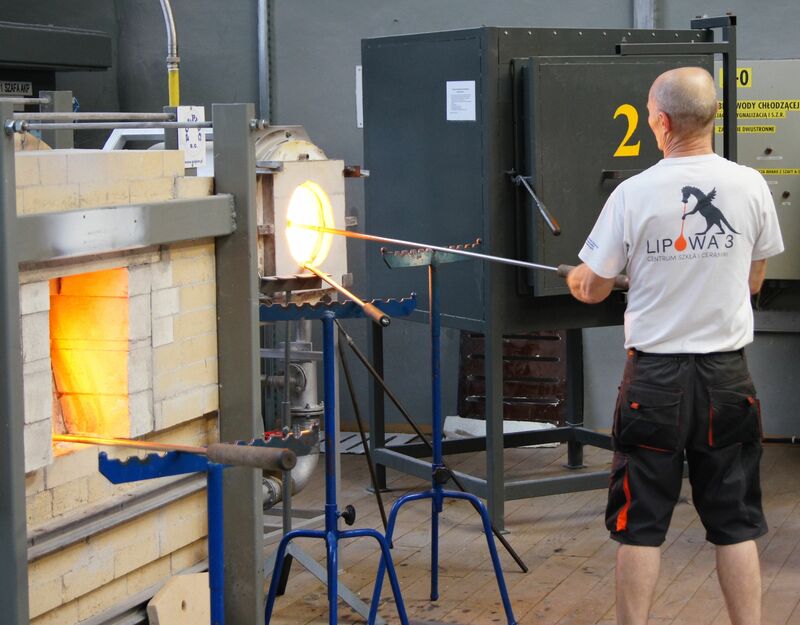 In the finished products there are dangerous stresses that pose the risk of glassworks’ self-destruction and thus the products should undergo an annealing process. The process is carried out in devices known as lehrs. The operation aims at the controlled removal of stresses in the glass. It involves slow heating of the products to the maximum annealing temperature (approx. 480oC), baking the products at this temperature (removal of stresses), followed by slow cooling of glassware for 48 hours to ambient temperature. After annealing, the products are grinded, polished and decorated. Grinding aims at eliminating the excess of glass in the place where the blowpipe was attached. The grinder, using special devices and diamond discs, decorates the glass in an original way. Glassware can also be decorated through gilding the edges, sanding, spraying with ceramic paints, manual painting, applying transfers or chemical depolishing.